Serena did a good job of creating a world that was every bit as fantasy as it was Christian. The story speaks of truth just as Christianity tells it. Although a fantasy story, Serena used the word ‘magic’ sparingly. I loved how she managed that. Rose was a beautiful, simple and soft character—absolutely different from what most stories make out redheads to be, *chuckling* which was refreshing. It was a pleasure watching her grow from Rose the country girl, to Ryn Naia, the princess. Rose handled well the sudden thrust of her true identity upon her and matured quickly. I loved that even when she learnt she was a princess, she didn’t lose her sweetness and simplicity. And that didn’t deter her from being the strong (and eventually confident) woman that she needed to be. Even though Ryn Naia’s story progressed much in years in the story, other characters that were part of her past life as Rose were not left behind. Serena filtered in updates on their lives every now and then without crowding the story. It was impressive. And because I grew to love these characters, I welcomed their stay. These words describe Julien de Gladiel: Prince-in-shining armor. His loyalty and manners sparkled his already sweet and adorable personality. Any girl would fall in love with this guy. Seriously. *winking* He carried an air of gentleness and friendliness that was well matched with the superiority of his title. Drinius and Gladiel make quite an interesting pair. I’m looking forward to seeing more of them in the book 2, ‘The Remedy’. I also can’t wait to meet King Jarryn. He was talked about by the other characters often enough and Serena allowed a little glimpse of his reality. He’s is a character I’m looking forward to reading first hand. 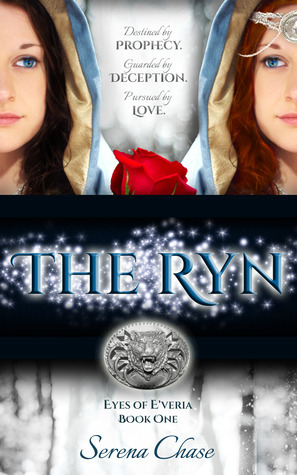 ‘The Ryn’ is a marvelous read. It is sweet, subtle and full of delightful encounters (like the Andoven and the Tirandov Isle *winking*). I have absolutely no complaints about this book. I put my pen down here because as a principle, I’m no fan of spoilers, though I love to drop hints. 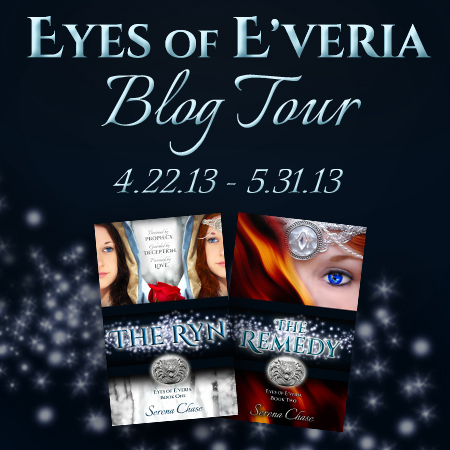 For a chance to win a copy of ‘The Ryn’ or ‘The Remedy’, click on the ‘Eyes of E’veria’ Blog Tour banner on the left column. A life-long lover of fairy tales, Serena Chase is the author of THE RYN (3/26/13) and THE REMEDY (April 2013) Together, these two novels comprise an expanded re-imagining of the classic Grimm fairy tale, Snow White & Rose Red and are the first two books in the Eyes of E’veria series. A frequent contributor to USA Today’s Happy Ever After blog and Edgy Inspirational Romance, Serena lives in Iowa with her husband, two daughters, and a white goldendoodle named Albus. She has been known to live vicariously through her hair, however, so don’t be too surprised if she looks a tad different from one day to the next. We all have our vices. Nice review here. Your review not only ignite my interest in this book, it also give me insight on how to write a book review on my own. Greatly appreciated. Ah, this is just my cup of tea! 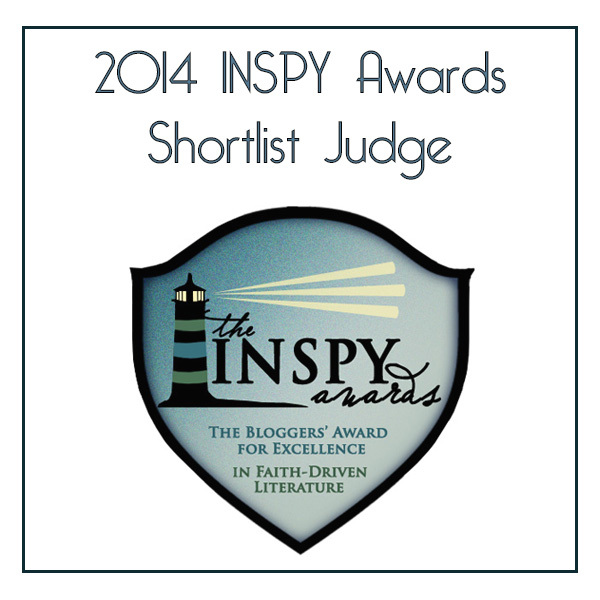 Can’t wait to read The Ryn, which is waiting (impatiently) on Kindle – now off to enter for a chance to win The Remedy! Beth, so glad you had fun here! How are you finding the book so far? Wishing you the best in winning a copy. Miranda–thanks so much for the review! I’m so glad you enjoyed THE RYN and I can’t wait what you think of THE REMEDY! Thanks for commenting, Cluster Critter and Beth — I hope you like the books–and good luck with the giveaway! Serena, couldn’t help but love the book. Loved ‘The Remedy’ even more if you must know. Getting ready to post it even. Thanks for letting me be part of your tour. I agree with you “simply put I enjoyed this book”! It was amazing! I recommend everyone read it! You won’t be disappointed! Lisa, I enjoyed this book so much I hurriedly started book #2. And I tell you, it only gets better! Thanks for stopping by.